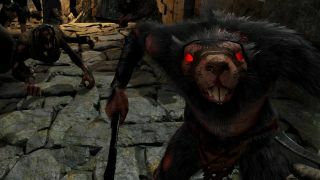 Vermintide is a first-person melee co-op game featuring Warhammer's lovable ratmen the Skaven, and if that sounds like your sort of thing then congratulations, you are allowed in my club. The ratocide game is being developed by War of the Roses' Fatshark Games, and it's pretty much Left 4 Dead but in the Warhammer universe. Again, yes. Ranged weapons will make an appearance, but the focus is on killing rats with a bunch of medieval melee weapons, as the city of Ubersreik crumbles around you. Evan Lahti previewed the game back in February, but because E3 it's been given a brief new trailer. It's up there, obviously, and it's making Autumn (Vermintide's release date) look like an awfully long time away.